Worrying statistics have emerged, placing meth – the Asia-Pacific’s most popular drug – at the top of its grocery list. Police seizures have quadrupled in five years, as production skyrockets in tandem with increasing economic integration into the world. And it’s a vicious cycle: the more economic opportunities increase for the region as a whole, the more the drug and its various derivatives are produced, which, in turn, leads to plummeting prices, according to a recent report by the UN Office for Drugs and Crime (UNODC). Asian drug cartels are only too happy with this, as their profits soar, despite the price reductions. A recent report by the UN Office of Drugs and Crime (UNODC) covers the southeast, the east and Oceania, excluding only South Asia. It deals with the 2008-2013 period, during which crystal methamphetamine production, including derivatives, rose from 11 to 42 metric tons. The drug traditionally comes in two forms – pill and powder. The shortened 'meth' is also known colloquially as 'ice.' However, there are a host of related drugs with similar effects, some more dirty than others, which also have their own statistics and owe their fame to Asia’s meth addiction. While pure crystal meth seizures doubled from 7 to 14 metric tons in the period mentioned, there is also a booming market for a whole slew of drugs producing a similar effect; the report particularly blames the incredibly popular 'yaba' pills for the explosion. Meth-derivative tablet seizures have exploded from 30 million tablets in 2008 to 250 million in 2013. An accompanying investigation by The Global Post has found that buying meth is, for the first time, cheaper than affording a meal at Burger King, although prices can fluctuate wildly depending on the region and its cities’ border policing. Volatile, rural, or simply poorly-governed areas are bearing the brunt of the problem. Particularly affected countries in the Asia-Pacific include Thailand, Cambodia, Laos, Myanmar, Vietnam and China; but South Korea, Malaysia and Singapore, according to the UNODC, are quickly catching up with increasing fan bases for yaba pills – although not always intended for local consumption. As if to add insult to injury, wholly foreign drug markets as far as the United States are also targeting the Asia-Pacific region. Asia alone accounts for pretty much everywhere from China to New Zealand, not including Russia and India. There is a tug-o-war between police efforts and production. 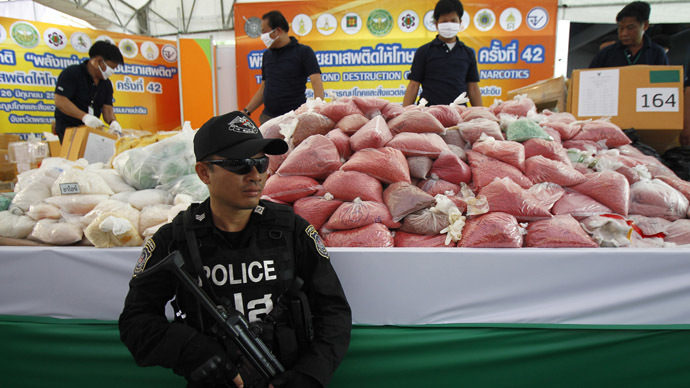 While the UNODC points to redoubled police efforts and claims that the “significant increase of seizures might partly be the result of effective law enforcement measures,” there is also the view that it is not enough in light of “expanding manufacture and an increase of trafficking to and through the region”, owing to growing interconnectedness of Asian markets. As The Global Post also outlines, most meth never makes it into police hands, while one rough UN estimate places pill production at a staggering two billion annually. According to the Post, that’s enough to keep high every man, woman and child in the entire United States for a week. And the pill figures do not even include pure crystal meth. The drug’s popularity can, in fact, partly be explained by Asia’s traditional poorer economic status to its neighbors – at least traditionally. In just one example out of dozens, Bangkok taxi drivers would use the drug to stay awake for days on end, in order to earn more money. But prolonged use is known to lead to not only complete loss of appetite, but drastic changes in personality, which erode the human being.